Jose Esteban (formerly of Michigan, now at Madrid) gave a talk today about intracellular trafficking, PI3K signaling, and Alzheimer's disease. I'm going to a few conferences this summer, so I'm going to use this as test-run for limning talks. Two-thirds of the talk was unpublished data, so I will try to paraphrase the results in figure form (parafigure?). Most of the seminar was about AMPA receptor (AMPAR) trafficking, so a quick refresher. AMPAR are the most common ionotropic, excitatory glutamate receptor in the brain, and it is thought that learning and memory comes from changing the number of AMPAR in synapses, viz. synaptic plasticity. Some stimulation protocols can lead to an increase in AMPARs at the synapse, called long-term potentiation (LTP), while other stimulation protocols remove AMPAR from synapses (long-term depression, LTD). Whence and whither do the AMPAR go from the synapse? From early endosomes and to recycling endosomes. All of this transport is controlled by a large web of signaling proteins, including, for today, PI(3,4,5)P3-kinase (PI3K). PI3K activity has been shown to be involved in LTP, while PIP3 phosphatases are involved in LTD.
AMPAR trafficking in endosomes is regulated by the Rab GTPas family. AMPAR at the synapse (top) are internalized via Rab5, then transferred to another endosome (early?) by Rab4. From there they are sorted to the lysosome for degradation by Rab7 (grey oval), or to back towards the synapse by Rab11. To look at AMPAR trafficking, the Esteban lab performed chemical LTD (cLTD), and measured two parameters. First, they simply measured the synaptic AMPAR current. Second, they looked at AMPARs directly by transfecting organotypic hippocampal slices with GFP-GluR2. Then to look at whether GluR2 was expressed at the plasma membrane, or in endosomes, they stained for surface GluR2. (I'm disappointed they didn't use SEP-GluR2) Under control conditions, following cLTD, they saw a decrease in synaptic current, and a decrease in both surface and total AMPAR in spines. 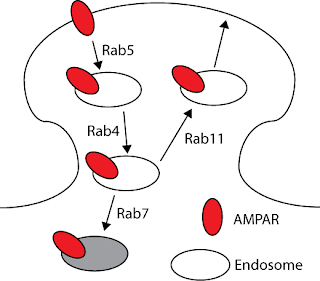 LTD (and thus AMPAR trafficking) is regulated by various Rab GTPases. 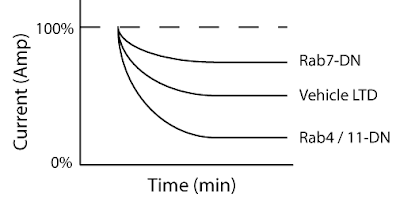 During normal LTD, you get a decrease in synaptic current of ~50% (not to scale). With either a Rab4 or Rab11 DN, LTD is increased. With a Rab7-DN, LTD is decreased. They then proceeded to disable individual Rab proteins by transfecting slices with dominant negative (DN) Rabs. When the transfected Rab4-DN, they found that the synaptic currents were decreased even more than control. By measuring AMPAR localization, however, they found that while the surface AMPAR level was decreased like control, the total AMPAR level in the spine was the same. This means that some AMPAR were internalized, but not properly distributed. To look more directly at lysosomal degradation, they performed cLTD in the presence of a protease inhibitor, leupeptin, which should block lysosomal degradation (Esteban said this was the first time this simple experiment was done.). However, leupeptin had no effect on the synaptic currents measured. To look at the role of the lysosome another way, they transfected slices with Rab7-DN, which would prevent AMPAR from being transported to lysosomes. In Rab7-DN cells, cLTD was in fact decreased, in contrast to the lack of effect of leupeptin. From this they hypothesized that once internalized, AMPAR can go two ways: to the lysosome, or back to the plasma membrane. If you block the lysosomal pathway, they then must go back to the PM. However, this means that the actual degradation itself is inessential for LTD. As a final experiment, they transfected cells with Rab11-DN, and found that this increased LTD. In the middle section of the talk, Esteban described two sets of experiments he published previously. Arendt et al, 2010 covered PI3K's role in AMPAR trafficking during LTP, which I covered in the very first post on this blog o' science. Jurado, et. al., 2010 showed that the PIP3 phosphatase, PTEN, is essential to LTD. In the last third of the talk, Esteban presented new work on Alzheimer's. One facet of Alzheimer's disease is that synaptic plasticity is altered, and in simplistic terms, may favor LTD over LTP, leading to a loss of spines. Since Esteban has been investigating PI3K and PTEN, he asked whether altering PTEN function could alleviate some of the symptoms of LTD.
Mice don't normally get Alzheimer's, so to generously give it to them, Esteban's lab transfected slices with amyloid precursor protein (APP). They then performed LTP on these slices, and found that APP almost completely abolished LTP. Then to see if PTEN could effect this, they bath applied a PTEN inhibitor, and found that it could partially rescue LTP. PTEN inhibition rescues LTP and memory. A. Vehicle, or PTEN (i.e. PTEN inhibitor, sorry for the label), allows normal LTP. APP almost completely blocks LTP. PTEN inhibitor is able to rescue LTD. B. In either an object movement or contextual fear conditioning test, PTEN inhibitors are able to rescue the APP phenotype. Having seen the effect of PTEN inhibitors on LTP, they next asked if it could effect behaviour. They implanted rats with a minipump full of the PTEN inhibitor, and performed two memory tasks. First, they employed an object movement task, where mice were familiarized with objects in a cage. One of the objects was moved, and the mice were tested to see if they noticed. Second, they used good old contextual fear conditioning. In both of these tasks, memory was impaired by APP (or perhaps a different Alzheimer's model, my notes are unclear), but rescued by PTEN inhibitor. I slacked in note-taking during the discussion, which is probably one of the more interesting parts of a talk for strangers. Here are two points I salvaged. Second, it is not clear why PTEN had no effect when applied alone. One might expect PIP3 to accumulate, which should effect something. Esteban noted that there are ubiquitous feedback systems, which could perhaps compensate for a loss of PTEN function. In the experiments where PTEN inhibitor ameliorates Alzheimers symptoms, he could have maybe looked at the AMPAR expression on the synapse to see if the PTEN inhibition is having a specific effect on synaptic plasticity. I think they did look at PTEN and Alzheimer's, but I skipped it in the interest of space (and iffy notes). If I remember correctly, they measured the synaptic current, and found that PTEN inhibition rescued NMDAR currents, and actually caused an increase in AMPAR currents over control.